Talking about postpartum incontinence, Fun Right?! As this new year begins, instead of focusing on specific workouts, I want to focus on a topic that is very real and embarrassing to many moms. As you can guess running should not make you “pee” your pants. Postpartum Incontinence or the uncontrollable loss of urine occurs in a reported 50% of all women. Within this percentage many are new mothers or pregnant women. This number is most likely higher but it’s an embarrassing condition to talk about so many choose to live in silence. The good news is there are great exercises that focus on the muscles of the pelvic floor which will help remedy this situation and keep women from having to change pants after sneezing, laughing, coughing (or running). I choose to write about incontinence today as I am training for my traditional running in the Annual Redondo Beach 10K on Super Bowl Sunday with my family. It will be my 15th running since the birth of my 1st child. Many moms I work with are terrified of running post baby, not just worried they cannot achieve the miles but that they will end up with a big wet mark between their legs while running amongst hundreds of other people. This is a normal reaction but a PREVENTABLE issue. Yes I said PREVENTABLE in all caps!!! How, you ask? Please read on to see my top exercises to prevent incontinence. These exercises can be performed carefully as early as 6-8 weeks after delivery. I again would try the easier lying exercises first and work up to the more intense. Ideally 2 sets of each exercise is the goal but you may start slowly with less repetitions and one set of each. Listen to your body! I want to preface that “impact “ exercises like running are not recommended the first few months postpartum and potentially longer if the mother is nursing. The new nursing mother is still producing the hormone “Relaxin” for many months after giving birth and this hormone affects range of motion women experience with their joints. It is easier to “hyperextend joints” post pregnancy when this hormone is present. Also jumping and running puts a lot of pressure on the muscles of the pelvic floor that makes the tissue weaker and more susceptible to leaky bladders. So before jumping into a program that includes any kind of running or jumping, I recommend starting first with exercises that will strengthen the pelvic floor and core muscles. I incorporate pelvic floor strengthening exercises in all Coremom classes. Here are some non-traditional exercises that will help get you “impact ready” and keep your pants dry! I love helping moms to get back to the activities they did prior to pregnancy or introduce them to more challenging types of exercise after their baby is born. I did not complete my first 10K until after my first child was born over 15 years ago and I waited until she was 6 months and I felt strong enough to run the distance. With just a little help we can get you feeling healthy, happy and running to the finish line. If you have any questions about these exercises or any other mommy questions, please reach out to me directly at momfit@verizon.net. Happy dry running and I’ll see you at Seaside Lagoon after the race. “I just ate a shoebox full of Halloween candy just so my kids wouldn’t”. In other words, welcome to the Holiday season! I hear this excuse from many moms, imagine the disappointment when I explain that Halloween chocolate and red wine does not constitute a balanced diet. This time of year is particularly stressful for moms as we are in the midst of planning Thanksgiving and the Holiday season is virtually upon us. Mom survival mode is now in effect. The treadmill you spent many waking hours on last summer is getting buried in clothes. Getting to the gym seems almost impossible because of the laundry list of things you have to accomplish. New Years resolution time is around the corner, but don’t put off your health until 2018. Small actions now will help you stay healthy through the holidays. Here’s 5 tips on crushing the holiday pounds BEFORE they happen. Moms do not have any time to waste! Don’t think you have to workout every day of the week to be successful. Also, try and get out of your head that if you are having trouble fitting in exercise than you should throw in the towel until January and visa versa. Three to Four days of “Quality” no waste 30-minute exercise sessions that combine your cardio, strength and flexibility in one swoop is better than nothing. Consider a meal replacement protein shake to get you through the day. I know most of these protein powders taste chalky but I have some recipes that “spice” them up! My favorite healthy holiday themed shakes are listed below. I use these meal replacements usually mid afternoon between lunch and dinner to avoid the afternoon crash. The great thing is you can make this in the morning, put it in a reusable shaker bottle, keep it cool and drink on the go. Don’t go into any holiday gathering like a toddler who hasn’t eaten all day. Eat a healthy meal prior to going if you know the party will have crap food. Or if it’s a potluck, my rule is always B.Y.O.H.F. “Bring your own healthy food”. At least this way you know you have something to eat. I will always taste the naughty food, but don’t make it your entire evenings meal. No I am not taking about healthy juicing or protein shakes, I am talking about wine, pumpkin lattes and festive adult beverages. Have I lost you? Seriously, this is important, lets try not to drink every day from October 31st to January 1st. Limit alcohol consumption; try to inundate your system with water before, during and after a function. This will help you from consuming too many empty calories and unhealthy sugars. This tip will also keep you hydrated and feeling good the next morning! Moms need sleep to actually function and feel good? What a concept! Healthy sleeping habits are vital in helping your body and mind recover each day. Create a habit of going to bed early and sleeping between 7-9 hours every night. Reduce caffeine (which is sometimes full of unnecessary calories-see above) and do your best to get those z’s. Insert eye roll right here especially if you are a new mom. I will write about the affects of caffeine on the body and why I am not a fan at a later date. If you are not sleeping through the night yet and you need caffeine to function the next day, believe me I will not stand in your way, so head to Starbucks. Most moms I know bust their butts during the holiday season trying to enrich everyone else’s holiday experience. Take time to take care of YOU during the holidays. Do not put off your health and wellness. Consistent exercise and proper nutrition will give you more sustainable energy, less stress, and more confidence so you don’t go “postal” on your family. Hopefully you will slow down and “enjoy” the season. If all of this does not motivate you, think about how good you will look in that tight black dress at a holiday function because you listened to ME! Isn’t that what it’s all about in the end? #winning! I love the holidays and any excuse to have a party and celebrate! 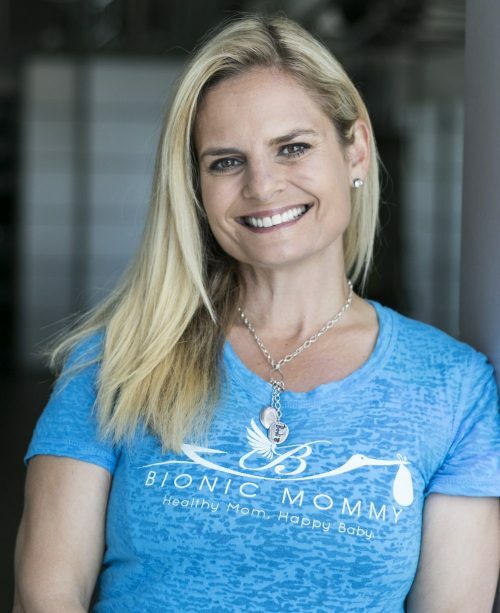 This year, I threw a fun Halloween event at Bionic Mommy. I invited moms to come with their little ones dressed up in costumes. Check out the Mommy Baby Gallery for fun photos of the event. I of course took the opportunity to dress up in my Cinderella costume; this was my first time trying to squat in a ball gown which was challenging to say the least. Watching the moms and babies in their costumes was tons of fun for everyone. The babies really hammed it up to the camera. It makes exercise so much fun when you are entertained by your baby dressed up like an elephant. Such a variety of cute costumes. Thanks to all who came and shared the event with me. We began our day with a TRX circuit formatted class to some popular Halloween-themed music. The class included a variety of functional and corrective exercises utilizing the TRX suspension straps and the Pelvicore balls. Making a fun holiday themed exercise class is a great way for moms to stay motivated and enjoy the occasion while getting a sense of accomplishment through exercise. The second part of our event included time for babies to socialize and the moms to enjoy a healthy snack and learn about some healthy products for themselves and their babies. Although Halloween is centered on candy, I like sharing tips of fun, festive, yet healthy options for Holiday themed snacks. It’s good to keep in mind that even though holidays are synonymous with bad food, you can still make good food choices and include creative healthy ideas into your own holiday festivities. I chose to feature a simple, yet tasty healthy snack for this event. This time of year persimmons are so delicious, so I served them sliced with Sunflower seed butter as a dip. Sunflower seed butter is a great alternative for those with nut allergies. In addition to the snacks I provided, I want to say thank you to Happy Family Organics for sending their rep Michelle to talk about and distribute samples of baby, toddler and prenatal snacks. We also had some great samples from Goddess Lactation bars and Bambo Nature USA for providing goodie bags with baby skin care. Stay tuned for future events and articles focused on exercise and nutrition tips on staying healthy during the holidays.